Written by: Cathleen Lu, Fall 2010 Digital Library Intern. As Falvey’s Digital Library takes on the digitization of older issues of the campus newspaper The Villanovan, from its inception as a monthly in 1893 to its more recent years, we find content ranging from dependable sports sections detailing the many Wildcat and Owl rivalries between Villanova and Temple, to reflective discussions on racism, to historically heavy pages documenting a campus during wartime. Indeed, 1943 issues of The Villanovan announced the college’s new warning system for air raid drills among reports of Villanovans at the front and alumni casualty records. But, taken in aggregate through the years and through events in history that may or may not have reached the Villanova campus, the newspapers provide another interesting take on American life–advertisements. Those of you who are fans of the AMC drama Mad Men might like to know that a little piece of the show exists in Falvey Memorial Library (figuratively speaking), and those of you who aren’t familiar with the cable series might find plenty of other surprises in early American advertising. Simple textual ads for naval uniforms and suits for 40 dollars eventually give way to fountain pens and Chevrolets in all their pictorial glory. 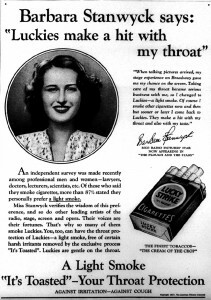 The idea of cigarette ads is anachronistic now, but from the 1930s to late 1960s, the ads, complete without Surgeon General’s warnings, were as consistent as they were prevalent. 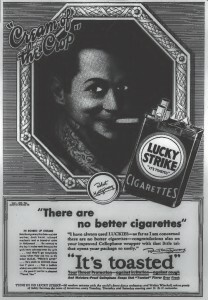 In the 1950s, Lucky Strike, Chesterfield, and Philip Morris were the bigger companies first battling it out, while L&M, Camel, and Marlboro came on the scene in later years. Through the decades, the ads change in tone to convey particular attitudes that include high society, campus cool, and a little bit of romance. And of course, celebrities always make an appearance. Barbara Stanwyck, Bob Hope, Joe DiMaggio, and Loretta Young are just a few of the recognizable faces. 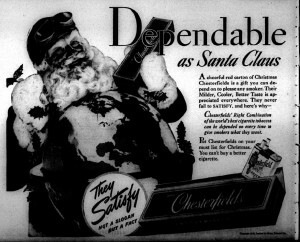 The most recognizable of all, however, might be Santa Claus, just in time for the holidays. Despite whether our hindsight finds these ads agreeable, valuable, or even fascinating, it does speak to the relevance of advertisements in both history and culture. Perhaps even more, it emphasizes an important aspect of newspapers in their “original” form, where the research value may extend far past the article of the day. The digitization of The Villanovan newspaper was a great idea. Also, I love to see those old advertisements.